Not so long ago - at the auto show in Chicago, to be exact to the end - the Japanese automaker Mazda introduced a special model of its popular Roadster Miata MX-5. However, this seemed a little Japanese, so they decided to introduce another special model, but on the next show. Following is a calendar of international motor show in Geneva. 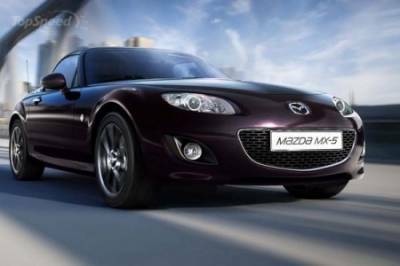 The model is called the MX-5 Special Edition Spring 2012 or easier - Spring Miata. The car is intended only for the European market and a number of different colors: black, pearl white, metallic gray and black. In addition to new color schemes, the car gets chrome frame grille, chrome accents bezel headlights and fog lamps. As for the interior, it will be finished with high quality brown leather and the dashboard gets a new navigator.